With a brand new baby around, one of the main things you spend your day doing is making sure everything is sterile and sanitised! From Bottles to changing Mats...my day is spent constantly cleaning and ensuring that everything is hygienic for the baby. In fact, we've been using antibacterial hand wash and gel so often that Bean Daddy's hands have become really dried out and sore! 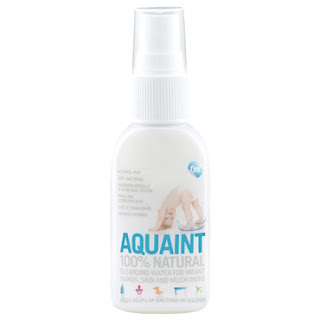 So when I was sent a bottle of Aquaint to try out, I was intrigued to see how it worked - it claims to effectively kill yet be gentle and natural enough that it's actually safe to spray it in your mouth! Aquaint can be used on everything - from skin to surfaces. It can even be used on products that a newborn will put in his mouth and 100% natural so there is need to worry about it having an adverse effect. I have found the travel sized bottle (50ml, £2.99) extremely handy for keeping in Tyne's changing bag, and using it to wipe down his changing mat after use, spray our hands after changing him and spray on his dummies before he uses them incase they've picked up any germs when he spat them out. There is also a larger bottle available (500ml) for £6.99. Aquaint is available from selected stores and online from www.jojomamanbebe.co.uk and will soon be available from many other retailers.